My very first project at International Mapping was for an interactive kiosk for Keweenaw National Historic Park, in Calumet, a mining town in Michigan’s Upper Peninsula. Historic buildings were modeled in 3D, while other buildings had the privilege of remaining as footprints. I really cut my teeth on Calumet. Learning how to simplify details so buildings are distinguishable on a touch screen of a finite resolution. But interactive kiosks aren’t all that common, the National Park Service is far more likely to have a brochure map, or a map on a large panel somewhere. I’ve been fortunate enough to work on a few 3D bird’s-eye view maps, each with a different level of detail. I thought if I showed off the most detailed as an example, you’d get a pretty good understanding of my process. 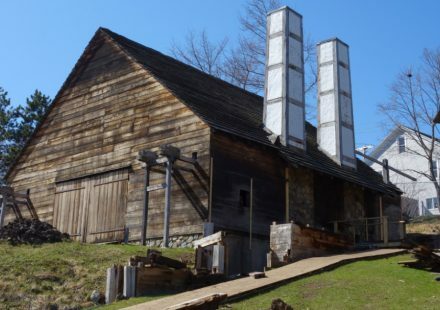 Saugus Iron Works National Historic Site is just north of Boston. It isn’t very big, which means for our 3D map everything gets to be seen in detail. Lots and lots of detail. 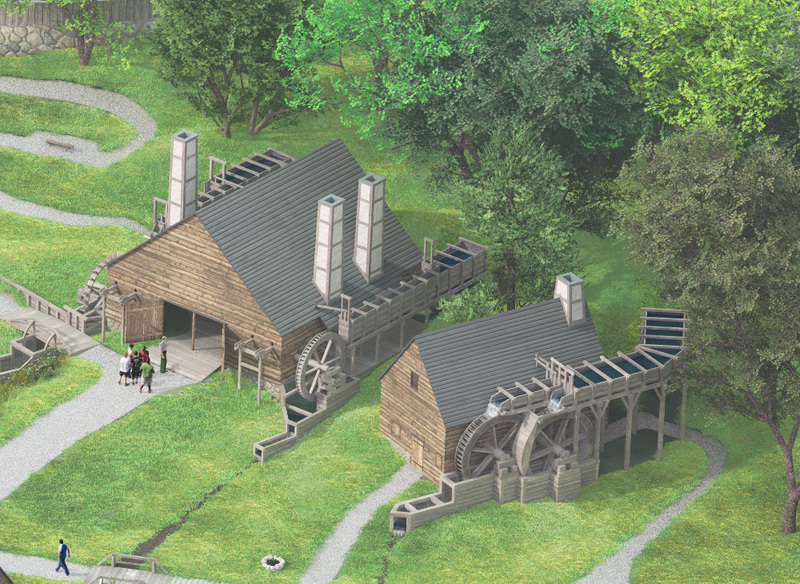 You can find the whole map amongst our portfolio on our main page, but here’s a close up of the Forge (with the Slitting Mill to the right). 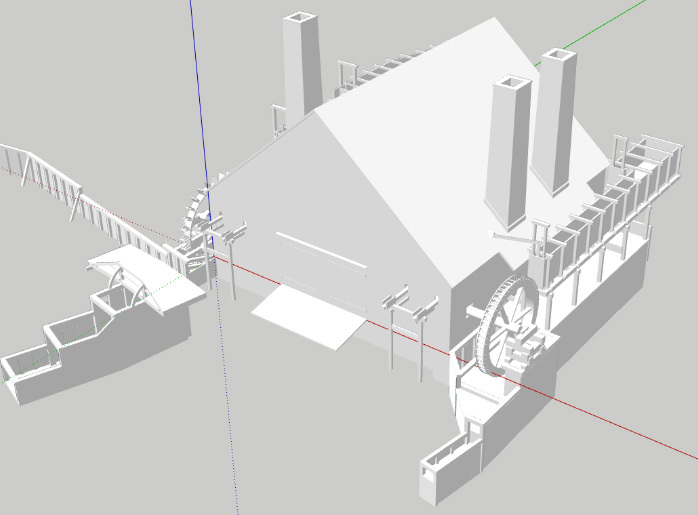 The actual structure is pretty simple, it’s the waterwheels and sluices that make this a bit overwhelming. When I model a building I work from reference photographs. I can never have too many photos. Usually we visit the site with the purpose of taking reference photos. For Calumet I could get away without any textures, there wasn’t any point to adding that level of detail. Not so with Saugus. SketchUp has rather crude UV mapping abilities. That’s okay, I can roughly map my textures in SketchUp. From there I bring the building into Vue, where the final rendering will ultimately occur. After bringing the Forge into Vue, I can finesse the placement of the textures and tweak their render settings. I’m getting a little ahead of myself however, I need textures to map onto the Forge. Luckily there are resources online when it comes to acquiring textures. The challenge was finding this wood texture (above), since it needed to match the actual wood of the Forge itself. It’s not an exact match, but it’s definitely close enough. Keep in mind that I’m not aiming for photorealism. The end result is still only a representation of the actual location, and part of the point is to exclude some details and to stylize the ones you do include. So now I’ve added textures to the Forge. (At some point in the texturing process the executive decision was made to open its doors.) You might think that this textured version in SketchUp doesn’t look nearly as impressive as the final render. That’s correct. What you see in SketchUp are the color textures mapped onto the 3D geometry. There’s more to texturing than just color. Look at that roof texture. See those shingles? scroll back up and look at the roof. Different roof! 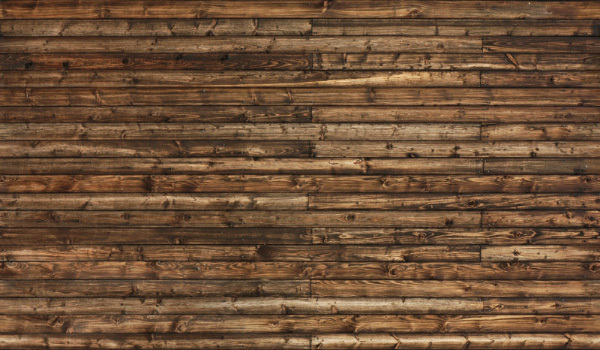 The actual Forge roof doesn’t have contemporary asphalt shingles, it uses long wooden planks, similar to siding. When I UV mapped the roof in SketchUp, I used a roof texture I had on hand. Once in Vue, I swapped that texture out for a bump map. This applies depth to a texture, with black representing low portions, and white representing high. The bump map for the roof. About as simple as bump maps get. Bump mapping also makes the stucco of the chimneys actually look like stucco. You can map any aspect of a texture: reflectivity, opacity, specularity. It goes on. It turns out the roof doesn’t need a texture map for the color, a bump map and a flat gray color is all it took to recreate the roof. Instead I could have modeled the individual planks that make up the roof, but that would have been tedious—a bump map is the simplest solution. There you have it. I’ve breezed through some key aspects of modeling and texturing, while entirely ignoring lighting and rendering. 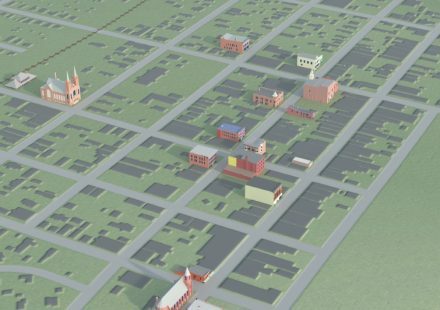 There’s a lot of work that goes into these 3D maps, and hopefully you have a slightly better understanding of the process. Makes sense to finish on the end product. We can’t have the last image be that bump map, can we?